Pavers are one of the most important decisions you will make for your garden. They’re essential for building a winning landscape your family and friends will love. But with a huge range of styles to choose from, going shopping for pavers can get a bit overwhelming. It’s crucial to know what you’re looking for before you head out to the showrooms. Just like the right plants, pavers can make a big impact with the right colours, textures and styles that complement those of your garden. If anything, pavers are an even more important choice to get right than your plants. Pavers will look the same throughout the year. On the other hand, your plants will change colour and texture constantly as you move through the seasons. Thankfully, there are so many rich and appealing types and materials to choose from. But where do you start? To help you get off the mark and heading down the ‘right path’ with your paving materials, here are our top tips for choosing the right paving to create a stunning garden for your home. We are blessed with a great selection of styles and materials for pavers here in Australia. Each one could be right for your next landscape project and have their own pros and cons. Here’s a list of the best styles and what you need to know to see if they’re the perfect fit for you. Stone is a popular choice for Australian gardens and for very good reasons. There is a huge range of shapes and sizes to match almost every landscape, and it’s widely known to be one of the most durable and versatile options. If you find a style you like, chances are it can be cut or moulded in hundreds of different ways. With the large range, you can always find a solution that looks great and fits your budget. Make sure you visit a showroom and find a trustworthy supplier of locally sourced materials. When you go shopping for paving, make sure you go for a thickness of at least 3cm to support foot traffic, and consider the weather. If the path will be used regularly then flat pavers will be the best choice. Also, ensure you check paver colour when wet – or you could be in for a surprise! Sandstone pavers offer a stunning finish almost anywhere you place it. Light, bright and available in a variety of shades and hues, sandstone pavers will lift any backyard with that Mediterranean touch of luxury. You can always rely on sandstone to stand the test of time and look great for a long time with very low maintenance. If you need a pathway that will be used often for walking, sandstone should be number one on your list. Slate has a softer texture than other paving options, mixed with a bold yet subtle finish. It’s known for the roughly-cut style and pastel blue-grey colours. Slate is easy to carve into flat pavers making it another consideration for heavy traffic. The only problem with slate is it can puddle easily in wet weather and create pavers that can become slippery. For this reason, it’s best for sheltered locations and houses that don’t get a lot of rainfall. If bold is what you’re looking for, explore all of the colour options slate can offer before moving on. It can provide a unique style that can’t be made any other way. Looking for unmatched strength and durability in your paving? Granite paving might be the perfect material. This more textured option has a number of benefits which also include the largest colour range of all of the pavers. Most importantly, granite offers a great visual impact and elegance that doesn’t take over the other elements of your garden. It’s a great choice for colour balance. Granite is a strong non-slip surface which makes it suitable for pool surrounds and garden walkways. Front yard or back, private or commercial, granite should always be on your shortlist if you like what you see. For an industrial and modern aesthetic, concrete block pavers are a popular selection. It is durable under-foot which is why they can be found in plenty of driveways around the country. Concrete blocks offer a mix of quality and affordability that stop many homeowners in their tracks. You can use them to achieve almost any look and feel – pave in charcoal for a stunning entrance, desert sand for the beach or add a splash of white luxury to your outdoor entertaining area. The best part – you only need to wash them a few times each year! 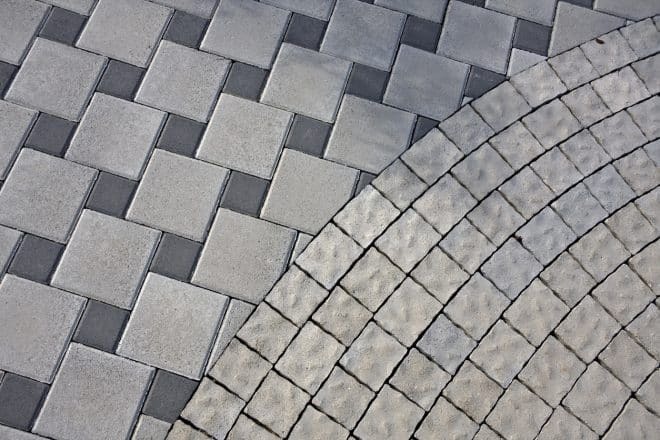 There are plenty of materials and styles to choose from when it comes to pavers, but it’s easy to narrow your options down when you know what to look for. And if you’re still not sure, contact Everlast or visit the showroom and ask our experts today!